Book Review- Freeman Hall's Retail Hell — Always Packed for Adventure! 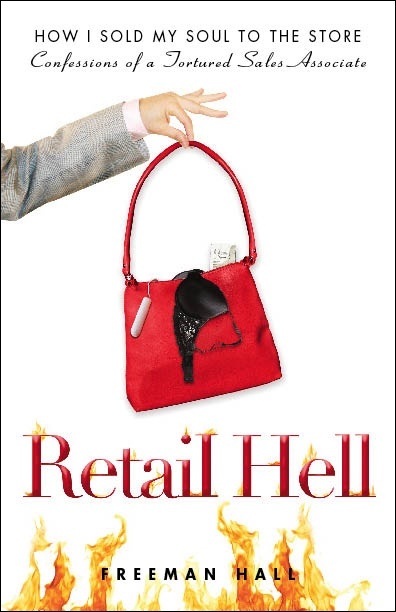 In Retail Hell, author Freeman Hall recounts his fifteen years selling handbags at a major department store that he has named "The Big Fancy". If you do a minimal amount of digging, it's easy to figure out the store and location of his former employer. This also happens to be my former employer and location, which made reading this book all the more interesting and held me back from writing this review until I had resigned. The book was highly entertaining to read and I breezed right through it. It is all very heightened for comedic effect or possible a result of his frustrations. I actually felt like some of the customers in the book, had to be the same customers that I have helped in my department. I have read other reviews that criticized Hall as being racist in his descriptions of the customers. He does have some cringe worthy descriptions and should have treaded more carefully. However, I feel like Hall was trying to vent his frustrations and went about it the wrong way. The store is located in a very multicultural community and one that has heavy tourism traffic. This can be a mixed blessing. On the upside, it's great to meet people from all over the world. On the downside, it's often exceedingly frustrating to communicate with language and cultural barriers. You quickly learn that different cultures have different expectations when it comes to the shopping experience and sometimes those expectations clash with store policies! I could relate to Hall's frustrations. Hall's dealings with his fellow coworkers and managers did not match with my experience. It seems that there has been a recent management overhaul. I was with the company for 4 1/2 months and had nothing but positive experiences with management. I also really liked the a majority of my coworkers, both in my immediate department and the adjacent departments. Having spent many years in the work force, I think this job is like any other job, it goes through cycles of good and bad times. Although clever the first couple of times, I didn't care for Hall's overuse of the Screenplay format. It was creative the first time and then felt like a gimmick and filler to lengthen the book. It was unnecessary and killed the pacing. There was a section in Hall's book that struck a chord with me and was ultimately a catalyst in my resignation. He wrote about his dreams of screenwriting and how working in retail hell left him too exhausted to get anything done. I spent my entire time with the company feeling completely physically and mentally drained. I've never had a job take so much out of me. I've also never put so much in for so little return. I've been told by many long time employees that it used to be a lucrative job. When the economy was strong and when the buyers were picking great merchandise, everyone in the store was making really great money. Times are different now. Hall made me see that I was pushing aside family, friends and dreams for a job that was giving me so little in return. This is not a bash on The Big Fancy, as there seem to be many people who are happy working there. There are many people who enjoy working with fashion and customer service. I am in a lucky position to be able to take the time to find a job that will make me happy. I loved Hall's Tips for Shoppers. Yes, Yes, Yes!!! Learn and live by those rules!